KarnaughMap 1.2 is certified "100% Clean" by Softpedia. KarnaughMap 1.31 (kmap131.exe) is a freeware program that runs on Windows 7/8. It is an interactive Boolean Algebra program extremely easy to use. You enter the specification through the truth table. The moment you click on a cell, the corresponding cell on the Karnaugh map also gets updated. Alternatively, you may enter data into the Karnaugh map directly. If you do so, the truth table will be updated real-time to reflect the Karnaugh map. The program constantly updates the screen, drawing the largest circle around the group of adjacent bits. The output box always displays the prime implicant solution. KarnaughMap 1.31 is a stand-alone Win32 executable that requires no DLLs to run. No Unzipping or installation required. Does not write to the registry; uninstallation is done by deleting the exe file.Extremely intuitive and convenient. A must-have tool for the freshmen electrical engineering student. Click here for the full version. 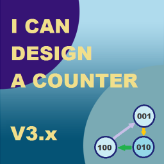 Please check out our related product I can design a counter. This is an automated Finite State Machine (FSM) design program for Android. It allows you to visually design a FSM by dragging your finger between bubbles. Then the program translates the bubble diagram to a state transition table. Finally, it finds the Boolean expression for implementing the FSM using D flip-flops or J-K flip-flops. Please check out the below third party product that I'm promoting. When you buy this product, I get a certain percentage of each sale.